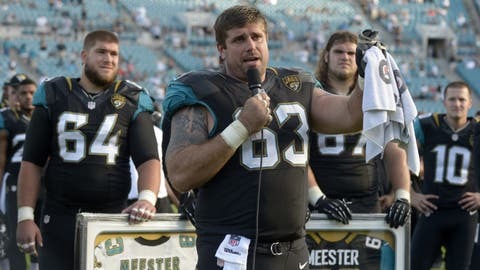 Jacksonville Jaguars center Brad Meester (63) thanks fans during a ceremony honoring him after playing in his final home game Sunday against the Titans. JACKSONVILLE, Fla. — For someone not used to being the center of attention and certainly not used to catching passes, Brad Meester seemed very much at ease with both. 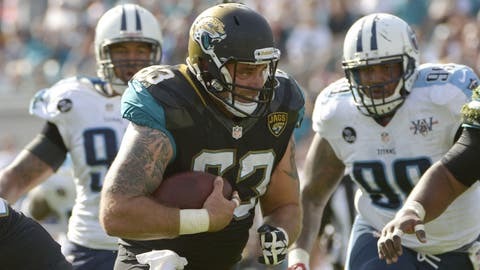 The Jacksonville Jaguars honored their longtime center with a ceremony on the field Sunday following their 20-16 loss to the Tennessee Titans in the final home game of his career. The four framed jerseys he received and the words of praise from kicker Josh Scobee were all well and good, but they won’t be remembered by those in attendance as much as what offensive coordinator Jedd Fisch devised for Meester. On Wednesday, the day after announcing he would retire following 14 seasons with the Jaguars, Meester opened the playbook and found in there — "deep in there," he said — a play called 12 Heavy. Considering the only time he could recall getting his hands on a live ball in his NFL career was a fumble during a preseason game, he had a hard time believing Fisch planned to use him as an eligible receiver should the Jaguars get inside the Titans’ 20-yard line. "I thought it had to be for (tackle) Cameron Bradfield or something. There’s no way that was for me," Meester said. "But he asked me if I wanted to do it, and I said, ‘Yeah, I’d love the opportunity to do it.’ "
With second down and eight yards to go from the 13 in the first quarter, Meester was positioned at the tight end spot on the right side of the line. Jacques McClendon was moved from left guard to center, with Drew Nowak coming in at left guard. Jacksonville Jaguars center Brad Meester runs for a first down after making his first career NFL reception on Sunday against the Titans. The Titans weren’t the only ones caught napping. Meester’s wife, Jamie, was otherwise distracted when the play began and had to catch the replay of his reception on one of the scoreboard screens. Although the Jaguars had practiced the play a handful of times during walkthroughs, Meester never clued her in on what might happen. "I didn’t even know," she said. "That was the thing. No, he never told me. He never said a thing." With the Titans apparently convinced the Jaguars would run the ball toward the left side, where tight end Marcedes Lewis was lined up, Chad Henne hit Meester on a screen pass for a gain of 9. 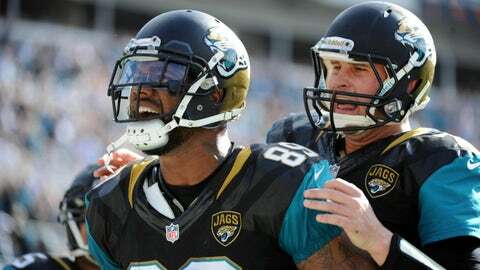 Henne and Lewis hooked up one play later for a touchdown which gave the Jaguars a 7-3 lead. "It worked out perfectly," Meester said. "The end went inside. I popped open. And honestly, what was running through my head all week was, ‘Don’t drop the ball.’ "
Takeaways & observations: Ken Hornack breaks down Jacksonville's loss in it home finale. Recap: The Jaguars were overcome by the Titan's power run game on Sunday afternoon. "I figured that was going to be a golden touchdown," said guard Uche Nwaneri, who was in position to help him out with a block before accidentally having his 292-pound teammate run up the back of his leg. Not surprisingly, the Jaguars called a timeout after the play in order to let Meester further enjoy his moment in the spotlight — and to also let him catch his breath. "He was having a hard time breathing on the ground," Nowak said. "And his smile was from ear to ear." "It was fun to see how fast the linemen block on the screen when Brad gets it," running back Maurice Jones-Drew said with a grin. "It’s a little different than when everyone else does. But that’s OK."
When the Jaguars first came out of the locker room, they had Meester be the only player introduced. While that meant a lot to him, the father of six girls got a particular charge out of hearing his name chanted after his reception. "That was pretty cool. I never had anything like happen in my life, except maybe at the house with kids," said Meester, who walked off the field at the end of the game hand-in-hand with 8-year-old Emma and 4-year-old Sophia. His catch was part of a nine-play, 80-yard drive. The Jaguars got another touchdown shortly before halftime but only managed a 36-yard field goal from Scobee the rest of the way. "If you didn’t notice, I’m a real quiet guy," Meester said. "I don’t say a whole lot. But I kept hearing they were going to do this and going to do that. I didn’t want to take away from the game. But several years down the road, I’ll be able to reflect on how much it meant to me." For the record, Meester came closer to finding the end zone than Jones-Drew, who was held to 45 yards on 13 carries in what could have also been his final home game for the Jaguars. He said hopes to learn in the months ahead whether he fits into the team’s plans for 2014 at age 28. "If it is, it is. If it isn’t, I had a great run," he said. "This is just part of this game, and we all know that. It’s the business aspect of it. But nobody wants to talk about that. It’s the pink elephant in the room." But for this afternoon, the focus was on the gentle giant and doting dad who surprised even himself. "Brad has always been a great influence on this team," Nwaneri said. "He’s not a rah-rah guy. He’s not a guy who’s going to be screaming and throwing things through walls or anything. Brad is a consummate professional. He takes all of his work and puts his heart and soul into it. We have to do the same thing, mainly because he’s been a shining example for us. "We all rally around Brad. And it’s really great to have somebody like that in your locker room. Not every team has that kind of player. He’s one of those guys who’s always been responsible and grounded, and we love him for it." Clearly, the affection was mutual.